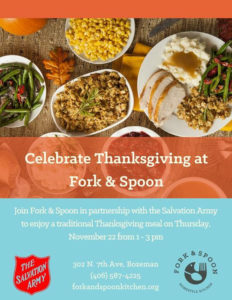 The Salvation Army will also be hosting dinner on Thanksgiving at the Fork & Spoon from 1-3 pm. The dinner will be totally donation based rather than the usual pay-what-you-can model, no registration needed. It’s Greek to Me will be hosting a free Thanksgiving meal on November 21st from 10:30am- 2pm(ish) or until the food runs out, no registration necessary. Midtown Tavern Free Community Thanksgiving Meal- 12-3pm Click Here for Event Details.